In an sport where distance is key to success, only those who possess true power in their golf clubs can strive for greatness, leaving their foes by the wayside. And only from Callaway, a leader in innovation and game-improvement, can golfers achieve that touch of magic. 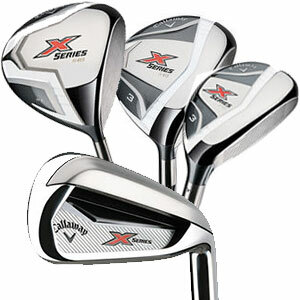 Callaway has pulled back the curtain and unleashed its X-Series range; packed with power, speed and forgiveness for golfers of all levels of experience. Starting with the X-Series Driver, right off the bat golfers will discover a whole new level of incredible distance they didn’t think possible – a clever mix of improved accuracy and slick aerodynamics to blow the opposition off the fairway. The Callaway X-Series Driver is ideal for golfer who want the ball speeds which lead to astounding distances off the tee. The fast face offers speed to allow players to hit it further and the forgiveness is designed for consistency even on off-centre hits. All this combines together to equal hitting the fairways further and with much more conviction, building confidence in your game on each and every tee shot. Looking for high launching fairway woods that are easy to hit off the turn at the tee will place you directly in front of the X-Series Fairway Wood. This fairway provides extreme confidence for every golfer. This incredibly versatile club is easy to hit out of all types of lies including the rough, while thanks to its Centre of Gravity location it is easy to launch the ball high in the air with improved ball flights. The fast face allows for faster ball speeds resulting in greater distances. So whether you are on the tee or playing a long shot into the green from rough or fairway, this superb golf club will give you the confidence to hit great shots with improved distances more often. The X-Series Hybrid is so easy to hit that’s its preferred to longer irons, and it’s also big on speed and distance, too! Whether you hit the centre of the face or off-centre, it’s engineered to make the ball go a long way. Thanks to the design and playability of hybrids, the marvellous Callaway Golf X-Series Hybrid will allow you to play from distance you wouldn't have thought possible. Sitting flush behind the ball, this club will instil confidence into the minds of all golfers and allow you to play for the green more often. The Callaway Golf X-Series Irons Steel 5-SW are ideal for golfers who are looking for an iron set that offers improved distances and excellent consistency even on miss hits. They will add extra yards to your game thanks to the cavity back design distance technology. The design also provides excellent forgiveness for better results across the entire face resulting in great shots even on slight miss hits. They look good, feel good and most of all will help you shoot lower scores! Rediscover your confidence and get the new Callaway X-Series range in your gab today. Available now at american golf. Speed has just been ramped up a notch. The new Callaway Golf XR Driver has landed! TaylorMade Golf has created a new copper style which is sure to impress golfers up and down the country as the TP Black Copper Juno SuperStroke Putter hits American Golf stores.